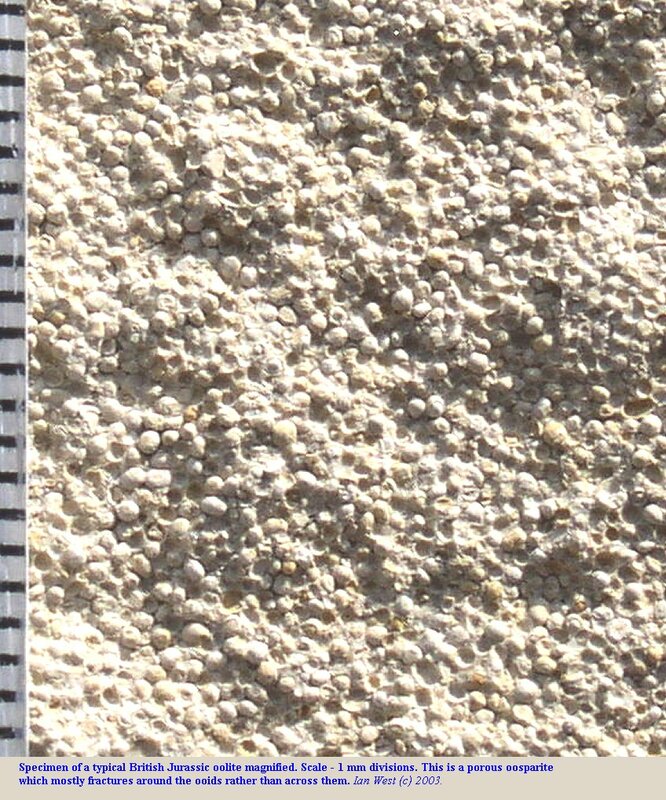 Oolites are a component of certain sedimentary rocks. However, I view everything Cambrian and later as superficial drift deposits, so I choose not to answer. Basalts are real rocks, so are eclogites. JimBob, I will be marginally surprised if you are an earlier vintage than I. For one thing I can remember how warm the summers were in the late Cretaceous! Class of '70. Yourself? Damn. You don't live in Texas do you? Or, ever worked for Conoco? I do. Never worked for Conoco but had three partners that did. Timko, Lindah, Schweirkert. Obviously, working with them I lived in Houston (ICH!) for 12 years until the worldwide consuling job in my hometown came up. Beautiful picture, Bass. Looks as if it cold have come from the broken well bore core obtained from the Smackover Limestone of the Gulf Coast of the US. Is the limestone pictured Upper Jurassic? If so it would be the ABOUT the same age as the Smackover. Below the Smackover is the mainly aeolian, arkosic Norphlet Sand that is then underlain by the Louann "Salt". This is a series of mixed evaporites (the core sitting on my desk is mostly gypsum) that was deposited during the opening of the Gulf basin. I am intersted to see how this correlates. Upper Jurassic Portland Group. The photo is not mine, but I remembered the distinctive oolites from a field trip eons ago. The red is oxidation. The green is likely evaporite deposits from a hypersaline brine. Likely gypsum or something like that. This would be a periodic deposition process that produces the green layers you see in these red bodies. Not to sure about the decomposing plants idea. Sounds a bit far fetched. The environment was likely pretty dry. Red Sandstone fairly formed in the oxidation environment. It contains Iron oxide and probably comming out from the chemical weathering of Basic o Ultrabasic rocks. This type of rocks form in backarc basins. What is a "nick point"? Magnificent picture, Bass. I would like to be there now - temp was 103 F yesterday and more of the sasme today. Since no one else seems inclinded to answere this, let's keep it amoung ourselves, the pros. A nick point in geology is derived from the same term in mathematics that denotes the single point where a curve changes slope abruptly. This term is also applied to the gradient of a stream. If streams flowed over only one homogenious substratum, the gradient curve for the stream would be steep at the head of the stream and shallow at the mouth of the stream. This can occur over a very short distance within a stream's profile. As pictured, the hard up-stream rock is in contact with a softer down-stream rock and a water fall is produced. The top of the waterfall is a nick point - the inflection point in the stream's gradient. Streams can go from softer rock formations to harder rick formations: these gradient changes often result in rapids. Which river carries the highest sediment load? This is for the whole world. Is it in total discharge or per volume water per year or per day? No. Sediment load is the total solids moved, both the mud and small sands in suspension and larger particles moved by saltation and other methods, e.g., by ligifaction, etc., along the bottom of the stream bed.